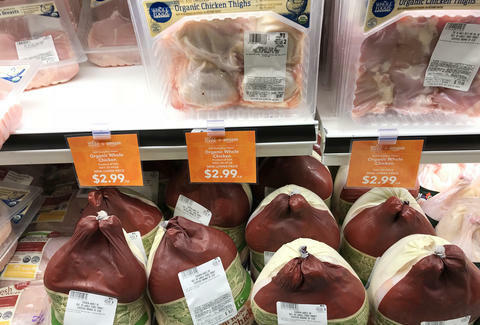 Whole Foods got a little cheaper again -- just in time for Thanksgiving. As part of the slew of changes Amazon promised with its $13.7 billion deal to buy Whole Foods this summer, the company introduced a new batch of price cuts at the organic grocery store chain on Wednesday. Most of the lower prices are for holiday food staples like turkeys and potatoes. Whole Foods said the lineup of new, holiday-pegged deals are now available at all of its stores in addition to the lower prices it rolled out in late August for items like avocados, rotisserie chickens, sauces, and other basics from its 365 Everyday Value brand. Members of Amazon Prime, which will eventually be used for Whole Foods' customer rewards program, get even bigger discounts. Specifically, while everyone can get organic and antibiotic-free turkeys at reduced prices ($3.49/lb and $2.49/lb, respectively), Prime members will get the same turkeys for $2.99/lb and $1.99/lb, respectively, according to a press release. The company has also cut prices on other Thanksgiving and everyday staples, including value packs of boneless chicken breasts (organic and antibiotic free), organic broccoli, raw peeled shrimp, 1lb organic salad mixes, organic sweet potatoes, organic russet potatoes, and canned pumpkin. Additionally, you'll find lower prices on organic products from brands like Lundberg Family Farms, Eden Foods, Pacific Foods, Organic Valley, and Tom’s of Maine as well as popular foods from Chobani, California Olive Ranch, Siggis, Applegate, and Fage. Unfortunately, the company did not release an exhaustive list of all the newly discounted items. While the price cuts on certain items will likely help you save a few dollars here and there on your grocery bill, it's worth noting that a recent analysis found that some Whole Foods prices have actually increased since the initial batch of price cuts arrived in August. The company reportedly lowered prices on popular foodstuffs and increased prices on other items to help cover the difference, a classic Amazon strategy. In other words, you'll save the most money if you only shop for the produce, meats, and other products that feature the reduced prices. It remains to be seen when Whole Foods will start using Amazon Prime as its rewards program, but the Prime-exclusive turkey discounts is a major first step. With any luck, additional price reductions will arrive sooner than later. Tony Merevick is Senior News Editor at Thrillist and plans to have Thanksgiving at a restaurant for the first time in his life this year. Send news tips to news@thrillist.com and follow him on Twitter @tonymerevick.